Horse businesses carry high risk, and different types of stable management structure leave you more or less vulnerable to lawsuits. You want to be protected as much as possible. Here's how. A sole proprietor is someone who owns an unincorporated business by himself or herself. 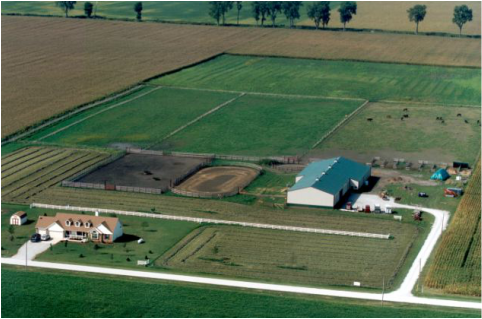 First, decide what you want your facility to be called (such as “My Horse Barn”). Then you simply file paperwork with your local authorities (usually the county and/or state in which your business will be located) saying you (your legal name, such as “Mary Smith” or “John Smith”) will be “doing business as (“dba”) “My Horse Barn”. While this is the simplest stable management structure, it leaves you wide open to liability. Suppose, for example, you have a barn on your home property and decide to take in boarders to help pay the mortgage. So you fill out the proper paperwork with the county, saying you are doing business as “My Horse Barn”. You take in a few boarders. And someone gets kicked, a horse gets loose and hurts himself or damages property, or someone decides you hurt their feelings. They can sue you and ALL of your personal assets are fair game in the suit. Even your home and your car. And your home insurance won’t cover you. So generally speaking, you do NOT want to structure your horse business this way. This is the least preferred stable management structure. If you do decide to go this route, carry a LOT of insurance. And here are the taxes you’ll need to file with the government: income tax, self employment tax, estimated tax, social security and medicare taxes, income tax withholding, federal unemployment tax. A partnership is the relationship existing between two or more persons who join to carry on a trade or business. Each person contributes money, property, labor or skill, and expects to share in the profits and losses of the business. This is sort of like a sole proprietorship except that there are two or more people involved. Again, it’s usually pretty easy to set up a partnership. You work out a written agreement among the partners, file the proper paperwork with your county or state, and you’re done. Your business name would be “My Horse Business, A Partnership”. But partnerships face the same liability problem as sole proprietorship, except that with partnerships, the personal and business assets of all the partners are on the line. You can all get sued, even if only one partner is the partner responsible for whatever made someone decide to sue. So this is also a non-preferred stable management structure. There are ways to limit liability with partnership structures, but this usually isn’t an structure that horse businesses choose (because there are better ways to limit liability, as we’ll see). The nature of limited liability partnerships vary from state to state. According to the IRS, a partnership must file an annual income formation return, but the partnership itself does not pay income tax. Instead, each partner reports his or her share of the profits or losses his or her own income tax return. The taxes that partnerships may need to file include: Income taxes, self-employment tax, Employment taxes (Social security and Medicare taxes, income tax withholding, Federal unemployment (FUTA) tax). A corporation is essentially the same as a person in the eyes of the law and the IRS. Just like a biological person, it has rights and responsibilities, pays taxes—the whole enchilada. So all liability accrues to it, not you. That’s why smart horse business owners choose to incorporate their businesses. This is by far the safest and best stable management structure. Forming a corporation is a bit more complicated that forming a sole proprietorship or partnership, so you should have an attorney or accountant walk you through the steps to make sure everything is done correctly. If you make a mistake along the way, you may end up not having a corporate entity at all—meaning you, again, are liable. • LIMITED LIABILITY COMPANY (LLC): This is a business structure allowed by state statute. An LLC is like a sole proprietorship or partnership, BUT owners of LLCs (called members) have limited personal liability for the debts and actions of the LLC. Like partnerships and sole proprietorsips, the profits (or losses) from the LLC “flow through” onto the owners’ personal tax returns. To form one, you have to put up capital in exchange for shares (stock) in the company. Your horse business name would then be “My Horse Busines, LLC”. • “S” corporation: This type of corporation is called “S” because it usually applies to people who are self-employed. To form one, you need to file the proper paperwork with your state government agency, put up capital, and assign division of shares (stock) in the corporation. Your business name would then be reported at “My Horse Business, Inc.”. Liability is limited to the assets of the corporation. Your personal assets are not on the line. The profits and losses from an S corporation “flow through” to the shareholder’s personal tax returns. This allows S corporations to avoid double taxation on the corporate income. Otherwise, the corporation would be taxed on the money it made, and you would be taxed again on the share of the profits that went to you. According to the IRS, to qualify for S corporation status, the corporation must meet the following requirements: • Be a domestic corporation • Have only allowable shareholders o including individuals, certain trust, and estates and o may not include partnerships, corporations or non-resident alien shareholders • Have no more than 100 shareholders • Have one class of stock • Not be an ineligible corporation i.e. certain financial institutions, insurance companies, and domestic international sales corporations. The taxes that an S corporation may be required to file include Income Tax, Estimated tax, and Employment taxes (Social security and Medicare taxes, income tax withholding, Federal unemployment (FUTA) tax). A final word: When deciding which stable management structure to use, keep in mind that you can use more than one structure for your business. For example, you might want to form an LLC consisting of you and your partners (or family members), and have the LLC own all of the land and structures for your business. But the actual business activities (boarding, lessons, etc) could be owned by an S corporation with you as President and your other partners as Vice President, Secretary, Treasurer, or simple shareholder. In this way, your personal assets could be protected from liability, and the businesses real estate assets (land and structures) could be protected from business liability. Discuss this with an accountant and attorney who is familiar with small business structures to find the best type of stable management structure for you.